On 14th September 2017 we began a new chapter in the At-Bristol story when we relaunched as We The Curious - a creative, multi-disciplinary space and a movement which champions the value of curiosity for everyone. We believe science is messy, creative, collaborative, living and for everyone – an integral part of culture. We believe a society of curious people is a more resilient, compassionate, creative and connected society. We were a National Lottery Millennium project and part of the regeneration of the historical Floating Harbour in 2000. 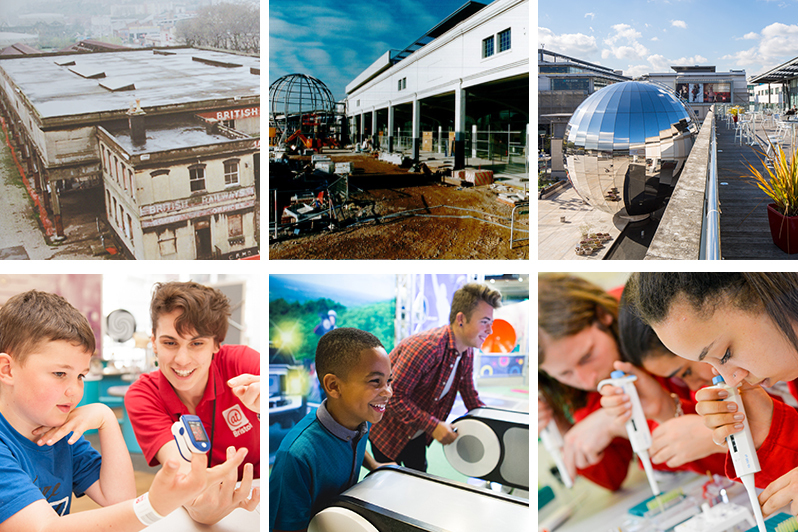 In 1984 Sir Richard Gregory founded the Bristol Exploratory, a visionary centre which allowed visitors to 'play with science'. It was first of its kind in the UK and it attracted over 2million visitors, until closure in September 1999. After the closure of the Exploratory, Sir Richard was a leading advisor on the development of At-Bristol alongside many other instrumental figures, sitting on the Board during 1997 and 1998 while the landmark £97m Milllennium project was developed. Building on Bristol’s history in science and engineering, At-Bristol Science Centre was developed from a 1906 railway goods shed, which was part of Brunel’s original Great Western network. It was one of the first buildings to use reinforced concrete, is Grade II listed and showcases engineering innovation and contemporary design - perfect for a science and discovery centre! Since opening in 2000, we have welcomed over 4 million people through ourdoors and launched hundreds of exhibits. We specialise in using the very latest multimedia techniques to inspire people of all ages. Our 3D ultra-high definitition Planetarium is the only one of its kind in the UK, visitors can fly through the universe from the comfort of their own seats or see experimental data visualisation with the joint venture Data Dome Project. We join the dots between science, arts, culture, industry and the community with activities and live shows which explore the world we live in. In our workshop we create interactive exhibits for We The Curious and centres round the world. We’re commited to becoming the most environmentally sustainable science centre in the UK. We The Curious is a leading sustainable science centre, we do this by reducing our impact on the environment and building on our reputation as a centre for conversation and research. Our YouTube channel is the most watched channel from a science centre in the world. Our Live Science team produce videos with our own brand of inspiring science that is watched by people round the world. We The Curious relies on people, from our skilled staff and volunteers, to the academics, community partners and industry specialists we collaborate with, and our visitors who inspire us every day. We are continually looking for ways to build on our diverse visitor base, working with and for our community, to create life-changing experiences, and empowering everyone to ask questions and get creative - with boundaries removed between science, art, people and ideas. The next two years will see our ground floor completely transformed as part of an ambitious project. With funding secured from BEIS and Wellcome, we’ve been asking the city of Bristol what they want to see in our venue and we’ll be building and developing these new experiences together. If you’d like to know more about this, you can download our Manifesto below or get in touch with us if you’d like to get involved.